Antique design hand carved in pure solid teak wood. The portrait can be customized as per your design also. A magnificent treat for the lovers of Indian artistry! A smiling flower plant has been beautifully stone carved Panel in these rectangular decorative marble wall panels. 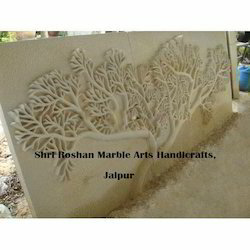 Put these superb pieces of marble carvings into the wall of your garden, porch, bathroom or other laces to feast the eyes with natural beauty. Dimension/Size: 1 mtr. X 1 mtr. Designed in variety of shapes and designs, with meticulous craftsmanship done on them, our panels are especially developed for doors and windows and other openings. We ensure to use moisture resistant wood in these panels to achieve standard quality in them and to ensure they last for long. Our organization specializes in offering a wide range of Wall Panels, which are water proof, easy to install and can withstand acid and alkali. These are manufactured using advanced processing and finishing techniques. Wall Panels offered by us are available as organic coated steel and aluminum and posses excellent finish. 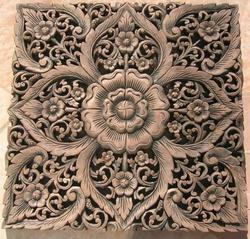 Improve the beauty of your home decor with this classy, grey colored, Wooden Carved Buddha Panel. Featuring a modern and contemporary style, this panel comes with a wonderful and intricate designing. Made from best quality wood, this panel is durable and sturdy.